Meazle has been DNA profiled ~ enabling genetic identification. What can we say about our mate Meazle ~ the history maker! 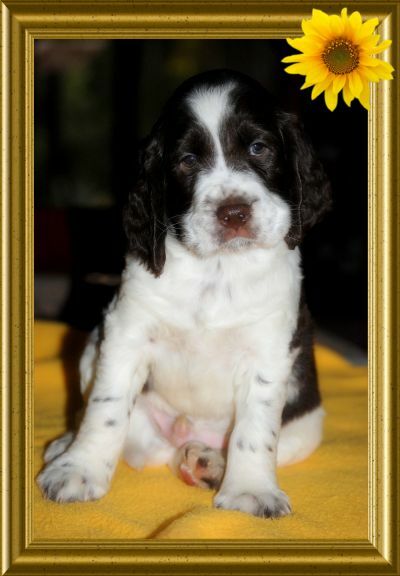 Meazy is an exceptional Springer Spaniel! A once in a lifetime dog. Bred from outstanding stock in Perth, Western Australia by Stephen & Ericka Baker, at just 5 yrs old ~ he was Australia's first 'Supreme Champion' show dog (of all breeds of dogs, not just the first ESS), & quite simply, he has surpassed all our expectations by winning many awards, accolades & trophies & tucked them all firmly under his collar! It doesn't matter what we keep asking of him ~ he gives his all & amazes us time & time again. From interesting bloodlines ~ a classic blend of European, New Zealand, Australian & USA stock ~ he has inherited his ancestors beautiful movement, something the ESS is famous for. Really quite special. NOT a flashy, high stepping, energy wasting movement however, Meazle moves very correctly 'pushing & driving' forward with the desired energy efficient, ground covering, effortless & breathtaking movement so necessary in a hunting Spaniel. Many judges have commented favourably on his way of going with one going so far as to publicly state "how precious this dog is; his movement is SO correct & true. He is an absolute treasure ........ we need to put THIS movement back into the breed" & she then went on to award him 'Best In Show'! Not only is Meazle's movement stunning, he also moves absolutely 'true' & as straight as an arrow. We never have to worry how fast or slow we run him for a judge ~ whether it be going 'out & back', or displaying his 'side-gait' ~ as his balance & proportions are so good that he always tracks up regardless of his speed, the terrain or conditions. Even on slippery concrete surfaces, he never falters ~ he just keeps moving 'true'. Oh yes! He will 'pace' as the ESS is inclined too at slower speeds, although not usually whilst on show! Being such a sound, honest & reliable Springer Spaniel means he cruised home with pots of energy to spare after successfully completing his 20 kms ANKC 'Endurance Trial/Test' (ET), with his temperature & pulse pretty much the same as when he started! An 'ET'is held over 20 kms & to be completed within 2 hours, it must be run on at least 3 different surfaces ~ the Trial also includes 4 x compulsory Veterinary checks & 2 x 'willingness tests' (one at the start & one at the completion) which are similar to a very basic Obedience test. Holding a current ANKC Height Card (& officially measured according to ANKC rules), Meazle stands at just under 52cms. therefor pretty much spot on according to the the ANKC ESS Breed Standard; "appox 51 cm/20 inches..."
Not only is he a STAR in the ring, he is a dream at home. Easy to live with, a big softy & so full of character! He also talks constantly & sings like you wouldn't believe! Just bring out the Harmonica & hear him hit those top notes! He will actually sit & have a serious conversation with you, although we have to admit he is a bit rusty on current politics sometimes! Meazy just adores water (just as a Spaniel should), & is a natural retriever, but there is nothing that he loves more than to be a show off at a Conformation show, compete in Gundog Working Tests, Retrieving Ability Tests, Obedience Trials (although he isn't always keen on training), Rally Obedience, Agility & Jumping trials. We are very pleased to announce however, that he has ceased burping in the ring ~ one trick he used to insist on doing every time a judge inspected his 'bite' (mouth)! He does have a weird doggy sense of humour sometimes! With one 'pass' already at his first Tracking Trial he is off & on his way to another Title & we are sure he will surely try his heart outscipline as well. We are proud that he has also been awarded 'Obedience Dog of the Year' twice (2 different Clubs) & his name adorns many other Club 'Showdog' & 'Gundog of The Year' awards. In 2012 we were thrilled to attended Government House as he was awarded an 'Australia Day Medal' ~ such a huge honour! Meazy has also received multiple invitations to represent the NT at National level ~ with his most recent invitation arriving in December 2016.